Look! We’re still here. Life goes on, and Natalie continues to get older and cuter! Today we celebrated Nata’s second Christmas Eve, whereupon she was gifted with pajamas (a tradition from my family). 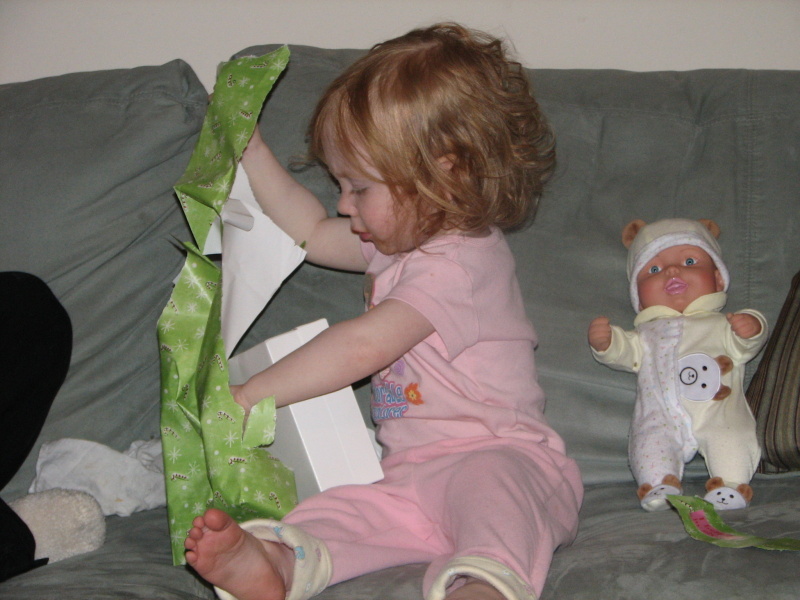 Unlike last year, she immediately took to opening her gift. Opening this gift was essentially the culmination of what amounted to days and days of trying (and sometimes not trying) to be good and not open the presents. She had a fun time and required little assistance. She was very excited to find her pajamas. We’re looking forward to spending Christmas Day together, and hoping we won’t be quite as sick as today. 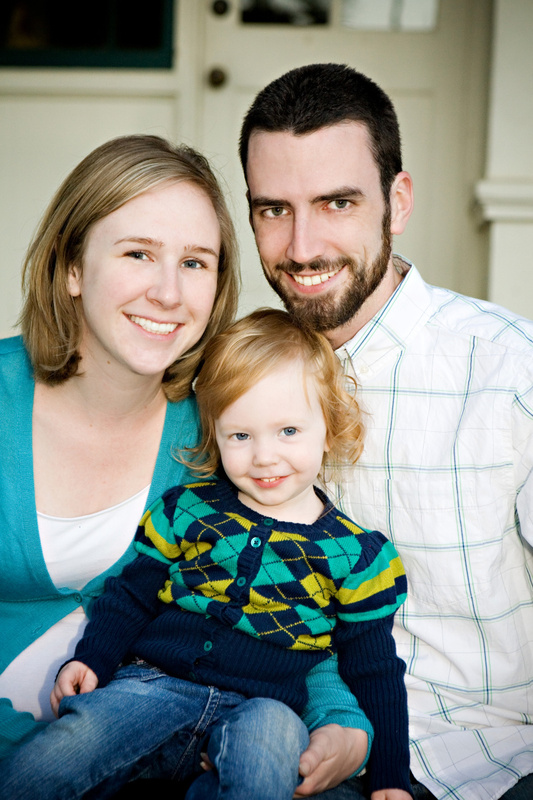 Recently, we had some photos taken by a photographer who attends our Adult Bible Fellowship at our church. The results speak for themselves. I’ll include a link to a full-size version in this post once I get it uploaded. About 22.5 pounds and 33 inches (at her 18 month checkup). Tall and skinny! She’s all around a playful kid! I can’t figure out if she is an introvert or an extrovert. She loves to pick her outfits. She will also compliment other people on their clothes, or hair (“oooh… preetty!”) or fish for compliments by showing people her own clothes. She is a stargazer. She loves to look at the “moom” (moon) and “ky” (sky) at night. One night she was devastated because it was too cloudy to see the moon. 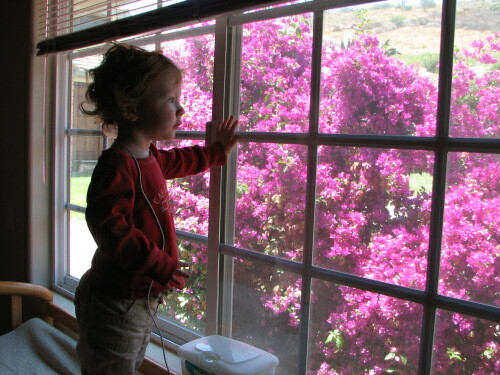 Fortunately our neighbors up the hill have a round window that looks like the moon… we let her believe that was it. She loves to play dress-up now, apparently. She got a hand-me-down fairy princess costume from her cousin and asks to wear it daily! Despite her petite size she is a great little eater, not picky at all. All day long she asks for “nom nom nommy”s (snacks). 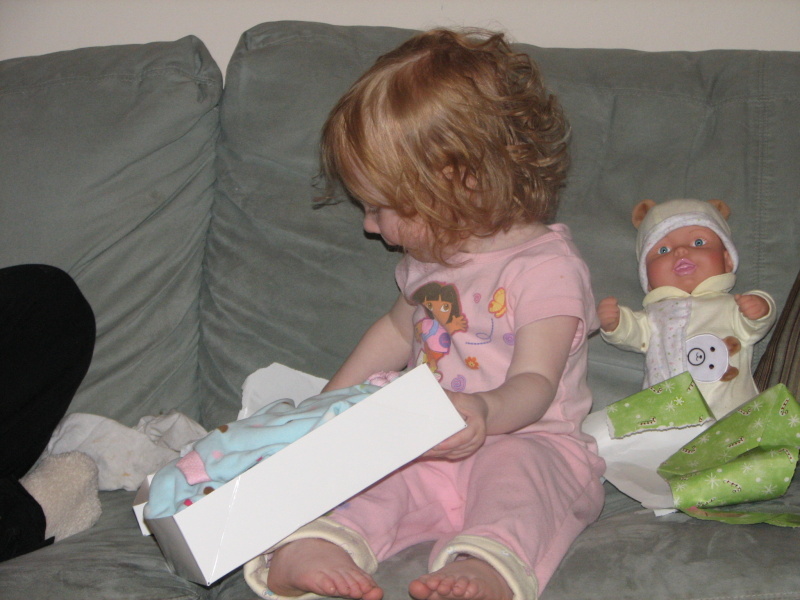 She doesn’t have a clue about the baby in my tummy, but she is very sweet and gentle with animals, other kids, baby dolls, stuffed animals… I think she will be a natural big sister and am not worried about it at all. She loves to sing songs with hand motions… you know… Itsy Bitsy Spider, Head and Shoulders Knees and Toes, Patty Cake. I have to be careful when I bring it up or she will ask for me to sing them all day. She is sooo much fun! It really does seem like Natalie has done a lot of growing up recently! She is coming up on 18 months old, and is having a lot of fun. She enjoys reading to herself in the car, standing on her head (sort of), and talking, singing, and just making noise. If you’d like to see that in high definition, I have uploaded a copy at 720p here. The file is encoded with the Xvid codec. You can download that here, or just use VLC for windows. 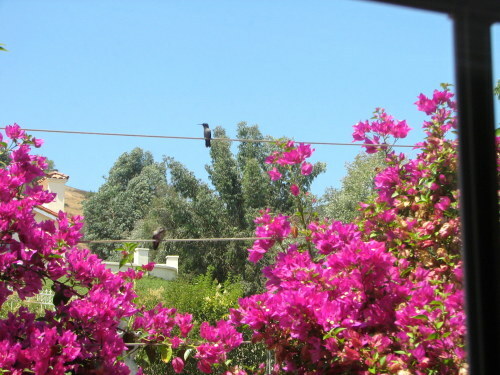 This week, a pair of hummingbirds seem to have taken up residence in the bougainvillea bush outside Natalie’s window. Every time we’re changing her clothes or diaper, those birds are sitting on the wire or flying around. Natalie loves to watch them. She calls them “bir” (bird) and has also started saying “little” to describe them. 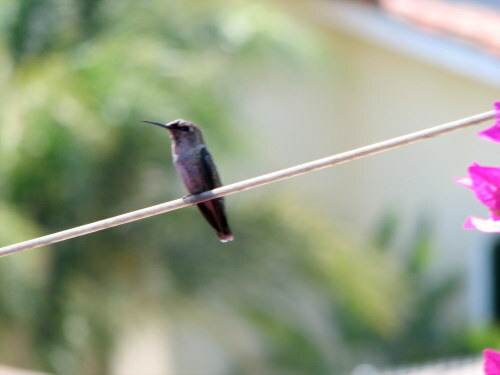 Here’s a couple pictures… it’s really hard to take pictures of hummingbirds, by the way! They are both in this picture, can you see them? One is on the lower wire. This is a funny program that arranges the most frequently used words on your blog, it’s called a “word cloud”. It’s easy to see what (who) we talk about the most! You are currently browsing the Our Life and Times blog archives for the year 2008.